GCSEs are under major reform across the country. We hope that the following information will help you understand some of these changes. English and Maths GCSEs were the first to be graded from 9 (High) to 1 (Low), in 2017. Most other subjects followed this grading in 2018 for the first time, with the few remaining subjects converting for those completing GCSEs in 2019. The postcard to the right gives a useful visual representation of how the new grades compare to the previous A*-G grades. Most students in Years 7 and 8 develop their knowledge and skills in a variety of subjects, many of which are likely to be quite new to them, To reflect this, Tretherras have designed a grading structure to allow students, parents and staff to understand how they are progressing. A student who is secure in the knowledge and skills we would expect from a child in that subject at that point of the year will be given a summary grade of “Secure”. Where they are consistently performing above these expectations a grade of “Extending” will be awarded. Those who are still honing their skills and growing their knowledge in that subject area will be given grades of Emerging and Developing, as appropriate. 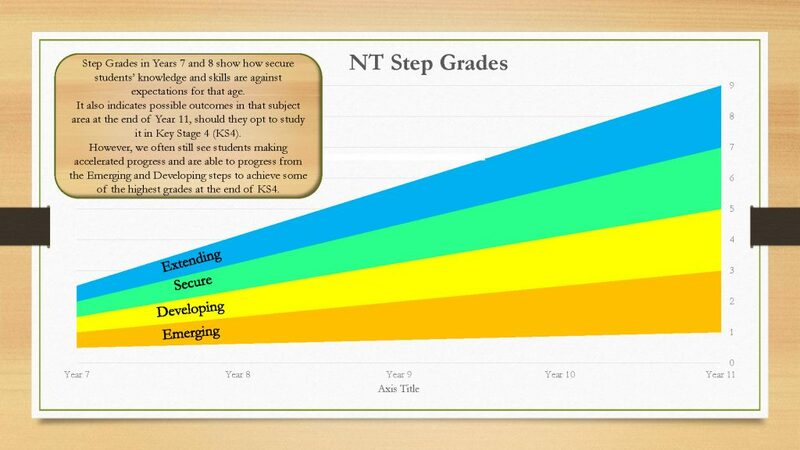 This pictorial explanation on the right (NT Steps Grades)may help explain this concept further. The new headline measure is Progress 8. The following 3 minute video explains how Progress 8 is calculated. Please be aware that although each student contributes to this measure, it is a school measure, not an individual student measure. We are now sending our progress reports out by emails only, rather than in the post, therefore, please ensure that we have your latest contact details on our system. Each year’s annual full report will still also be sent home by post. Please contact the main reception by emailing reception@tretherras.net or by calling 01637 072080 to update them.